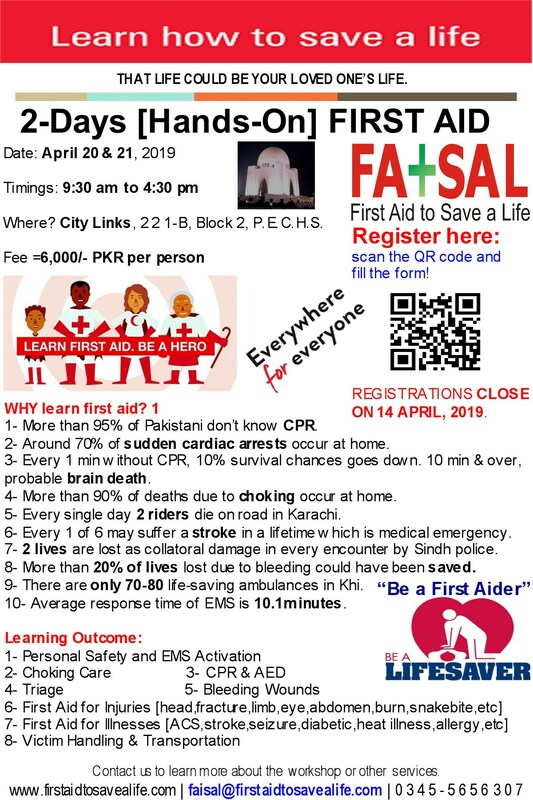 First Aid to Save a Life (FATSAL) is pleased to announce 2-days “CPR, AED & First Aid” hands-on training in Karachi on April 20-21 2019. National Course: The course fee is =6,000/- PKR per person inclusive of course notes, certification, quick wallet card, refreshment/s & lunch. 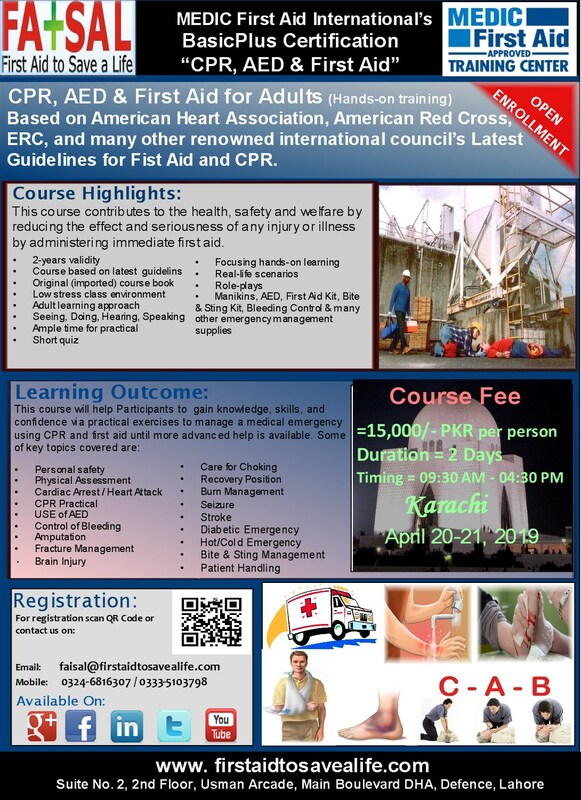 International Course: The course fee is =15,000/- PKR per person inclusive of course book, quick wallet card, MEDIC First Aid certification, refreshments and lunch on both days. The last date to register and pay course fee is: April 14, 2019. This entry was posted in First Aid CPR and AED and tagged 1-Day Training Programs, 2019, ABC of Resuscitation, accredited first aid and cpr trainings, Accredited first aid training courses, accredited first aid trainings in pakistan, accredited training program, advance first aid, Advanced First Aid, AED, AED and First Aid for Adults, AED Implementation Program, aed training, aed training programs, aed trainings in pakistan, AEDs, AHA, AHA First Aid Training Courses, American First Aid Courses, American heart association, anti snake venom vials and pressure bandage, anti-snake venom vials, Approved First Aid Courses, ARC, ARC First Aid Training Courses, automated external defibrillator, basic first aid, Basic First Aid and tagged 1-Day Training Programs, basic life saving skills, basic life support, BasicPlus CPR, BasicPlus CPR AED and First Aid for Adults, BasicPlus Training Program, bleeding control techniques, blood loss, BLS Course, Cardio Pulmonary Resuscitation, CE Courses, control of bleeding in snakebites, conventional CPR training vs online CPR class, corporate first aid, courses, CPR, cpr and aed, CPR and AED for Adults, cpr training, cpr trainings, cpr trainings in lahore, cpr workshops, CPR Workshops in Karachi, CPR workshops on world heart day, CSPS, defibtech aed, discount offers, discount offers on trainings, emergency care and first aid, emergency first aid, Faisalabad, first aid, first aid and cpr, first aid at home, First Aid compliant with Pakistan requirements, first aid course meeting local requirements, first aid courses in 2017, First Aid CPR and AED, first aid cpr and aed training in faisalabad, first aid cpr and aed training in hyderabad, first aid cpr and aed training in islamabad, first aid cpr and aed training in karachi, first aid cpr and aed training in kohat, first aid cpr and aed training in lahore, first aid cpr and aed training in Pakistan, first aid cpr and aed training in peshawar, First Aid CPR and AED Trainings in Faisalabad, First Aid CPR and AED Trainings in Gujrat, First Aid CPR and AED Trainings in Islamabad, first aid cpr and aed trainings in karachi, First Aid CPR and AED Trainings in Lahore, first aid cpr and aed trainings in multan, First Aid CPR and AED Trainings in Pakistan, First Aid CPR and AED Trainings in Punjab, first aid for adult, first aid for adults, first aid for all, first aid for amputation, first aid for animal bites, first aid for asthma, first aid for babbies, first aid for baby, first aid for baby care, first aid for babysitters, first aid for back injuries, first aid for brain injuries, first aid for breathing problems, first aid for building staff, first aid for burn, first aid for businesses, first aid for care homes, first aid for caregivers, first aid for carers, first aid for chemical burn, first aid for child care, first aid for children, first aid for choking, first aid for clubs, first aid for cold emergencies, first aid for concussion, first aid for dengue fever, first aid for diving coaches, first aid for ear injury, first aid for early year educationists, first aid for electrical burn, first aid for everyone, first aid for fainting, first aid for fall from height, first aid for families, first aid for family, first aid for fitness instructors, first aid for for NGO staff, first aid for for not breathing, first aid for for seizure, first aid for fracture, first aid for frostbite, first aid for grandparents, First Aid for Ground Staff, first aid for head injury, first aid for heart attack, first aid for heart failure, first aid for heat emergencies, first aid for heat exhaustion, First Aid for Heat Illness, first aid for heat stroke, first aid for home, first aid for home carers, first aid for hospitality staff, first aid for hot water burn, first aid for hotels, first aid for infant, first aid for infants, first aid for instructors, first aid for janitorial staff, first aid for nannies, first aid for nosebleed, first aid for nurseries, first aid for office workers, first aid for parents, first aid for patients, first aid for pediatrics, first aid for physical trainers, first aid for schools, first aid for small business, first aid for snakebite, first aid for special kids, first aid for sports clubs, first aid for sports coaches, first aid for sports industry, first aid for steam burn, first aid for stoke, first aid for sun burn, first aid for swimming coaches, first aid for teachers, first aid for teenagers, first aid for unresponsive, first aid is for everyone everywhere, first aid meeting national requirements, first aid to control bleeding, First Aid Train the Trainer Courses, First Aid Train the Trainer Courses in Karachi, first aid training, first aid training and floods, first aid training azad kashmir, first aid training badin, first aid training balochistan, First Aid Training Courses in 2016, first aid training courses in hyderabad, First aid training courses in islamabad, first aid training courses in karachi, First Aid Training Courses in Karachi Pakistan, first aid training courses in lahore, first aid training faisalabad, first aid training for fitness instructors, first aid training for fitness trainers, first aid training for gym instructors, first aid training for physical instructors, first aid training for physical trainers, first aid training for small businesses, first aid training for teachers, first aid training for teachers in Australia, first aid training for teachers in canada, first aid training for teachers in Gulf, first aid training for teachers in Kuwait, first aid training for teachers in Oman, first aid training for teachers in Saudia, first aid training for teachers in UAE, first aid training for teachers in USA, first aid training gilgit, first aid training guidelines 2015, first aid training hattar, first aid training hyderabad, first aid training islamabad, first aid training islamabad-rawalpindi, first aid training karachi, first aid training kohat, first aid training kot lakhpat, first aid training kpk, first aid training lahore, first aid training multan, first aid training murree, first aid training pakistan, first aid training pehsawar, First Aid Training Programs and tagged 1-Day Training Programs, First Aid Training Programs and tagged 2014, first aid training providers, first aid training punjab, first aid training quetta, first aid training rawalpindi, first aid training rawat industrial estate, first aid training sindh, first aid training skardu, first aid training sundar industrial estate, first aid trainings for free, first aid trainings in 2015, first aid trainings in 2018, first aid trainings in islamabad, firstaidtosavealife.com, flood and first aid training, free first aid courses, free first aid trainings in islamabad, free first aid trainings in Karachi, free first aid trainings in Lahore, free resources, HAINES, HAINES Position, haines recovery position, Hands-Only CPR, hanies position, hse courses in islamabad, HSE courses in pakistan, hse training courses in islamabad, hse training courses in karachi, hse training courses in lahore, ILCOR, Instructor Development Courses in 2017, international aed training courses, international cpr courses, international first aid courses, international first aid cpr aed training courses, international first aid training center in Afghanistan, international first aid training center in bangladesh, international first aid training center in Bhutan, international first aid training center in China, international first aid training center in India, international first aid training center in Iran, international first aid training center in Maldives, international first aid training center in Nepal, international first aid training center in pakistan, international first aid training center in Saudia, international first aid training center in UAE, international first aid training centers in asia, international first aid training centre in pakistan, international first aid-cpr-aed courses, International Training Certification Course, islamabad, Islamabad-Rawalpindi, Islo Rwp, Karachi, karachi sindh, karachiites, karachitan, karachite, KE, Lahore, latest aed guidelines, latest cpr guidelines, latest first aid guidelines, Latest first aid training guidelines, Latest first aid training guidelines of 2015, LHR, local first aid course, medic first aid, medic first aid international, MEDIC First Aid International Courses, Medic First Aid International in Karachi, MEDIC First Aid International Trainings in Faisalabad, medic first aid train the trainer, medic first aid trainings, mental health and first aid, modified haines position, national first aid course, new courses launched in 2014, occupational safety training institute pakistan, online CPR training, outdoor first aid, oxygen first aid for emergencies, Pakistan, PMDC, practical snakebite first aid training, practical snakebite first aid training in Pakistan, prcs sindh, primary assessment, Punjab, rawalpindi, remote first aid, Restart a Heart Day, Restart a Heart Workshop, save a life be a hero, Sindh, snakebite prevention and floods, spinal motion restriction, startup, startup business, startups in lahore, sudden cardiac arrest, training course, training for teachers in canada, training program, trainings, trainings in 2015, trainings in 2018, USA Certification Courses, USA First Aid Certification Courses, What does the American Heart Association (AHA) say about AEDs, what is cpr, what is primary survey, what is SCA, why 30 compressions, wilderness first aid, world first aid day, World First Aid Day in Karachi, world heart day, world heart day 2018, www.firstaidtosavealife.com. Bookmark the permalink.